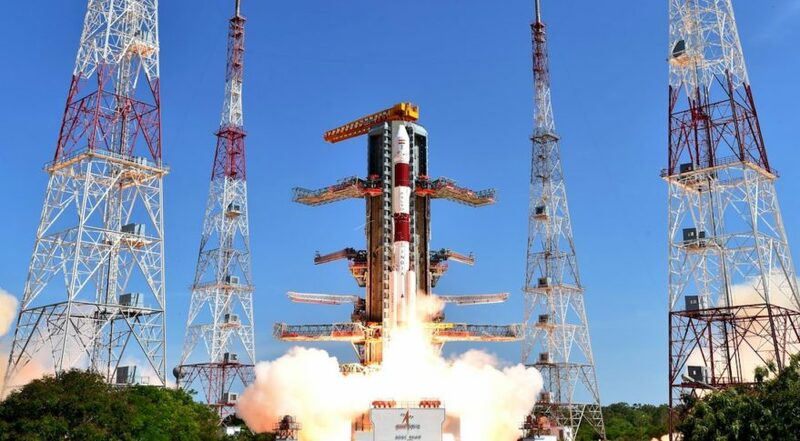 PSLV is third generation launch vehicle indigenously designed and developed by ISRO. It is one of world’s most reliable and versatile workhorse (launch vehicles) with 39 consecutively successful missions by June 2017. It is a four stage launch vehicle and first Indian rocket to be equipped with liquid stages. It can take up to 1,750 kg of payload to Sun-Synchronous Polar Orbits (SSPO) of 600 km altitude and payload of 1,425 kg to Geosynchronous and Geostationary orbits. The uppermost stage or fourth stage of PSLV comprises of two Earth storable liquid engines. The third stage is solid rocket motor that provides upper stages high thrust after the atmospheric phase of the launch. Second stage of PSLV uses an Earth storable liquid rocket engine, known as Vikas engine, developed by Liquid Propulsion Systems Centre. The first stage uses the S139 solid rocket motor that is augmented by 6 solid strap-on booster.